We’d love your help. 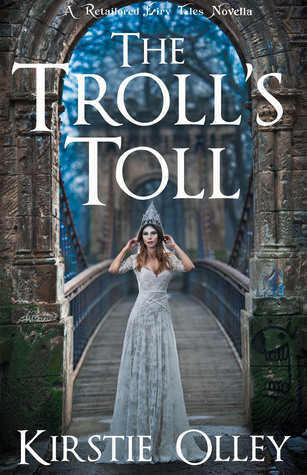 Let us know what’s wrong with this preview of The Troll's Toll by Kirstie Olley. To ask other readers questions about The Troll's Toll, please sign up. This was a cute little novella with an undertone of looking beyond appearances. Having been telling tales (the good kind and the cheeky) since before memory she finally put fingers to (typewriter) keyboard at age 8 when she attempted to write her own ‘Goosebumps’ tale. Kirstie continued on to teach her ninth grade English teacher the importance of setting word counts for short story assignments by handing in a 27 page novella. Word counts remain her greatest foe to this day(a Having been telling tales (the good kind and the cheeky) since before memory she finally put fingers to (typewriter) keyboard at age 8 when she attempted to write her own ‘Goosebumps’ tale. Kirstie continued on to teach her ninth grade English teacher the importance of setting word counts for short story assignments by handing in a 27 page novella. Word counts remain her greatest foe to this day(apart from big hairy spiders). Kirstie runs the gamut of speculative fiction from superheroes and modern fantasy, to pre-apocalyptic fantasy and science fiction, the odd dalliance with Lovecraftian horror, but she loves to write her Retailored Fairy Tales series best and has a particular penchant for cross-dimensional tales. Her stories have won and received Honourable Mentions in competitions, and been shortlisted in national fiction awards. Kirstie lives in Brisbane, Australia with her husband T-J, son Xander, daughter Harlequin, and the rest of her menagerie.